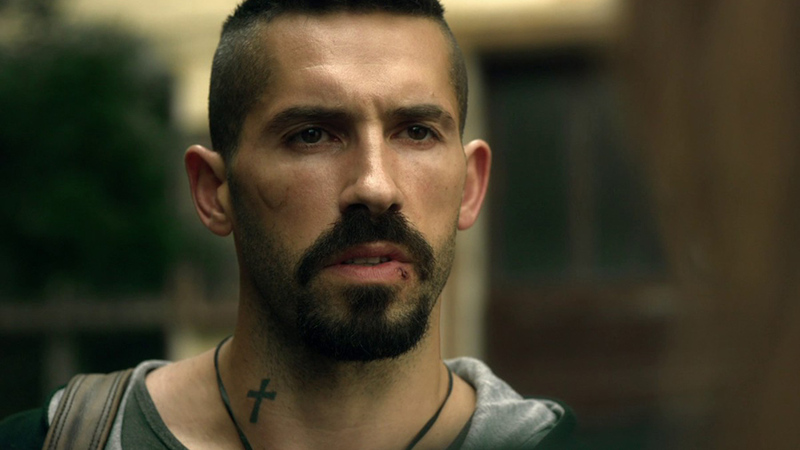 Fans of direct-to-video action know Scott Adkins well, and know well that he rules over that particular roost. They also know that his Undisputed films sit at or at least very near the top of the mountain in terms of quality, awesomeness, and general badassery. And the long-awaited fourth installment, Boyka: Undisputed, is just the kick in the face that fans have been after. 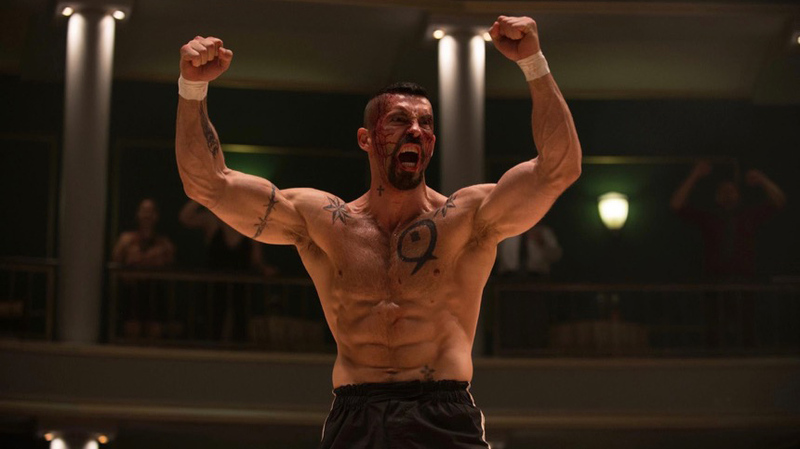 After escaping to freedom at the end of Undisputed 3, Yuri Boyka (Scott Adkins), the self-proclaimed “most complete fighter in the world,” plies his trade on the open market. This primarily means pummeling unsuspecting opponents in underground fights, but he’s close—so close, like one step away—to going legit and hitting the big time. But he’s also doing God’s work, literally, using the gift God gave him as best he can, spending his earnings on bibles and whatnot for the local church. But before Boyka can find crossover success, he accidently kills his opponent in the ring. His guilt and quest for redemption leads him back to Russia, where he’s a wanted man, and to his victim’s widow, Alma (Teodora Duhonikova), who’s indebted to a local crime lord (Alon Aboutboul). This “just when you think you’re out, they pull you back in” set up borrows a page from the ‘80s teen comedy playbook, and he has to fight to save a community center, save himself, save the potential love interest, and maybe sacrifice his one shot at glory. The story plays out as expected. I mean, what, you can’t trust the shady, scene-chewing Russian mob boss who runs a small town with an iron fist to keep his word? People these days. And Boyka has to fight a crazed prison giant (6’8” body builder Martyn Ford) with head tattoos and a Hannibal Lecter mask? Didn’t see that coming from the very first scene. 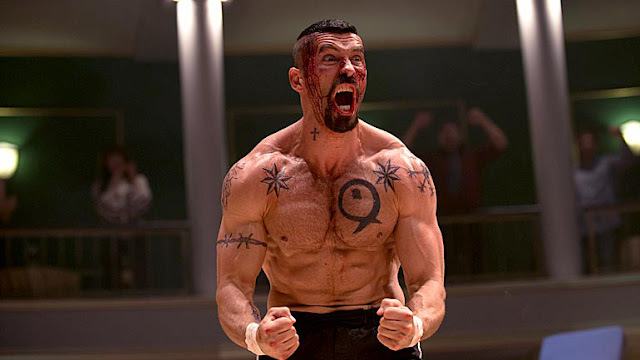 As one may expect, Boyka spends most of the movie scowling, brooding, punching, and hissing sparse lines through clenched teeth. (Homeboy has a nice mouthful of pearly whites for a dude who spent years fighting in Russian prisons, just saying.) There’s not much in the way of subtlety, as he blatantly tells Alma he didn’t come to save her, he came to save himself. But for all the drama, plot probably isn’t why you’re watching Boyka. Most of us watch Undisputed movies for the action and to witness Scott Adkins kick dudes like three times before landing on the floor. Thus far, each chapter has had a different fight choreographer, though they’ve all been strong. This time out, Tim Man handles those duties, and the finished product is fantastic. He previously worked with Adkins on Ninja II: Shadow of a Tear, with spectacular results, and he’s also doing the same job on the upcoming Triple Threat with Adkins, Michael Jai White, Tony Jaa, Iko Uwais, Tiger Chen, and everyone. The fights are full of high-flying kicks and unnecessary spinning and flipping. Maybe it’s not the most practically fighting style, but holy hell does it look awesome. (These are supposed to be “MMA” fights, but there’s almost zero ground work, which, while functional, doesn’t always translate well to the screen as far as action scenes go.) Most of this happens in the ring, but Boyka also has a few opportunities to throw down against multiple faceless goons in the streets. While frequent Adkins collaborator and Undisputed 2 & 3 helmer Isaac Florentine takes a producer credit on Boyka, not much is lost. Todor Chapkanov (Asylum as well as second unit and AD stuff on tons of movies, like London Has Fallen) takes the big chair, but if you told me Florentine secretly directed this, I wouldn’t say you’re lying. Though largely confined to the squared circle, the camera soars around, giving the performers space and distance to showcase their talents, and keeping the action from ever feeling like it’s just one cookie-cutter fight after another. At it’s thematic core, Boyka is about one man trying to make peace with God and with himself. Boyka has this obvious gift given to him by his creator, and it would be a sin to waste it, but it’s not initially clear how he should use it. As his priest tells him early on, just buying bibles isn’t going to cut it, and he embarks on his gritty, stone-faced quest.